Today at the Craven Community College Foundation’s 9th Annual Community Fabric Awards, Steve Tyson received the 2019 Community Fabric Award for Individual Leadership. 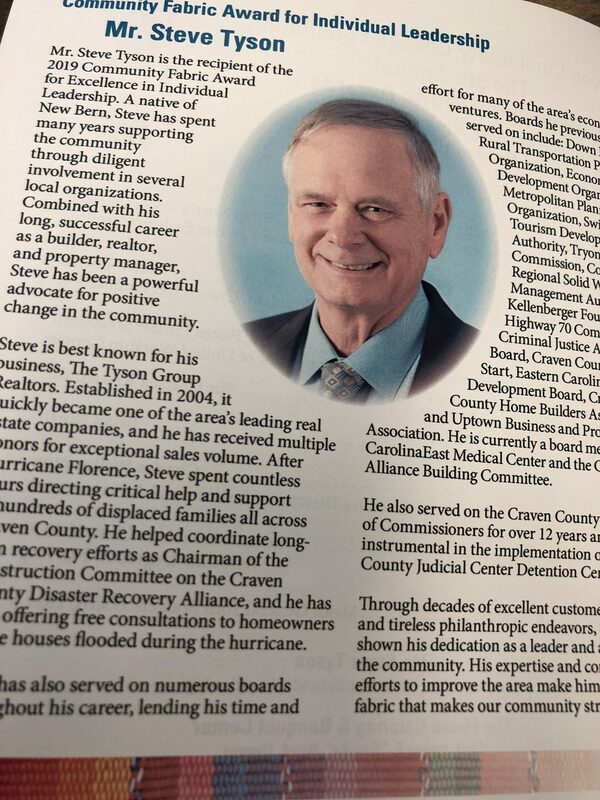 Steve has spent countless hours since Hurricane Florence helping families recover, through his leadership with CCDRA and through his knowledge and compassion with each individual in need. We are grateful for his work on the CCDRA Board of Directors and all he does for our community! The original Sheltering and Temporary Essential Power (STEP) program implemented with funding from the Federal Emergency Management Agency (FEMA) wrapped up in early April with repairs completed on more than 2,100 homes. Using state funds, North Carolina is extending the program to 202 additional single-family homes in 12 counties. The program provides partial repairs at no cost to homeowners so Hurricane Florence survivors can return to and remain in their homes while longer-term repairs continue. The original STEP program provided repairs to homes with up to $17,000 in damage. The 202 homes included in the second phase of STEP applied for the original program but had slightly more damage. North Carolina Emergency Management stepped in using state funds to include these additional homes. Work crews from Baptists on Mission, the North Carolina Conference of the United Methodist Church and four general contracting companies are currently making repairs to the 202 homes in Bladen, Brunswick, Carteret, Columbus, Craven, Cumberland, Duplin, Jones, New Hanover, Onslow, Pender and Robeson counties. Hurricane Florence survivors who still face long-term housing issues are urged to participate in the Disaster Case Management program. The state has contracted with experienced case managers who will work in conjunction with faith-based and volunteer organizations to help meet survivors’ needs. There are additional state and federal programs which are either underway or awaiting funding to assist Hurricane Florence survivors. FEMA’s Hazard Mitigation Grant Program helps eligible homeowners and local governments to rebuild, elevate or buy out flooded properties. North Carolina is waiting for notification from Washington on another major program that will help with Hurricane Florence housing recovery, the federal Community Development Block Grant−Disaster Recovery (CDBG-DR) program, funded by the U.S. Department of Housing and Urban Development. In October 2018, Congress passed legislation appropriating CDBG-DR funds for Florence and several other natural disasters, but North Carolina does not yet know what share of the funds it will receive or the rules for using those funds to help with long-term recovery. The state Department of Health and Human Services is also assisting hurricane survivors with housing solutions through its Back@Home NC program. The initiative assists families who were not eligible for FEMA assistance to transition to safe and stable housing. To date, more than 200 families have moved to permanent housing through the program. Be Safe. Do not attempt to move downed power lines. Call your utility company immediately for assistance. Contact your insurance company. Some insurance companies require an adjuster’s approval before work can be done. Take pictures and videos, if possible, of the damage. Cover holes in your roof or walls with a tarp if you can do so safely to prevent additional damage. Do not pay for work up front. Inspect the work and make sure you are satisfied before you pay. A reasonable down payment may be required for some projects, but don’t pay anything without getting a written contract. Avoid paying with cash; use a check or a credit card instead. Beware of any contractor who tries to rush you or who comes to your home offering assistance. If an offer is only good “now or never,” find someone else to do the work. Avoid contractors, including roofers, who go door-to-door offering services. Instead, get recommendations from friends, neighbors, co-workers and others who have had work performed on their homes recently. Get three written estimates for the work, if possible, and compare bids. Check credentials and contact the Attorney General’s Office and the Better Business Bureau to learn about any complaints against the contractor. Ask to get the contractor’s certificate of insurance directly from their insurance company, not from the contractor. Before work begins make sure you get a written contract that lists all the work to be performed, its costs and a completion date. Read the contract and make sure it includes any verbal promises you may have received from the contractor. Services like cleaning or storage of your belongings often come with extra charges, which can really add up depending on the length of storage. Watch out for price gouging. Under North Carolina law, businesses cannot charge too much for goods or services when a disaster, an emergency or an abnormal market disruption for critical services has been declared or proclaimed by the Governor. Under the law, the Attorney General’s Office can put a stop to price gouging and seek refunds for consumers who paid too much. The courts may also impose civil penalties against price gougers of up to $5,000 for each violation. We Can Help If you have a complaint about disaster repair or price gouging or need to check out a contractor, contact us for help or call toll free within North Carolina at 1-877-5-NO-SCAM. The upcoming holidays can be a difficult time for those who are experiencing loss after Hurricane Florence. Loss of treasured items full of holiday memories may make this holiday season especially challenging. On Saturday, December 1, “Getting through the Holidays: A Seminar Dealing with Loss after the Hurricane” will cover topics listed below. The seminar is free & open to all in the community. This seminar is free! If you know someone who has experienced loss after the hurricane, please invite them to attend. All are welcome!